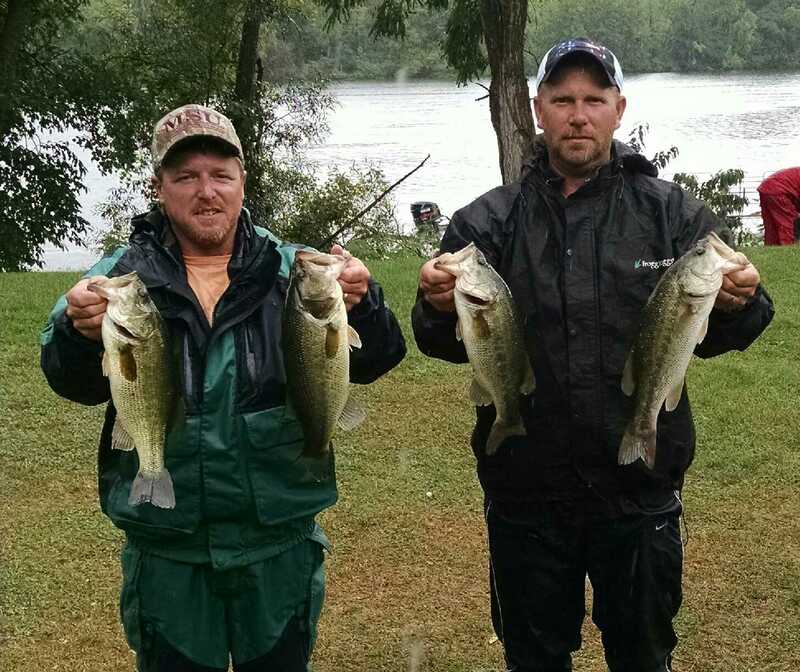 1st Place: Kevin and Kelly Warner caught just four keepers, but they were enough to topple the 48 team event. Their 11.65 pound bag was over a pound more than their closest competitor. Anchored by the big bass of the tournament, a 4.62 pound largemouth, the victory won them $761 and another $384 for the big fish, making their day worth $1,145. Their bait was the predictable jig, which they slung at thick weeds and shallow log jams. Two of their keepers came from weeds, including their last keeper in an isolated weed pocket 12 feet deep with just 40 minutes. "We found that weedbed and flipped the jig into it. We were surprised too!" Kevin said with a laugh. Two of their fish, including the big fish, came from shallow log jams. "We caught lots of fish," Kevin admitted, "but the keepers were spread out. We got one early; two around the midpoint, and our second biggest with just 40 minutes left." He also admitted to running "up and down the entire river" several times to find cooperative fish. 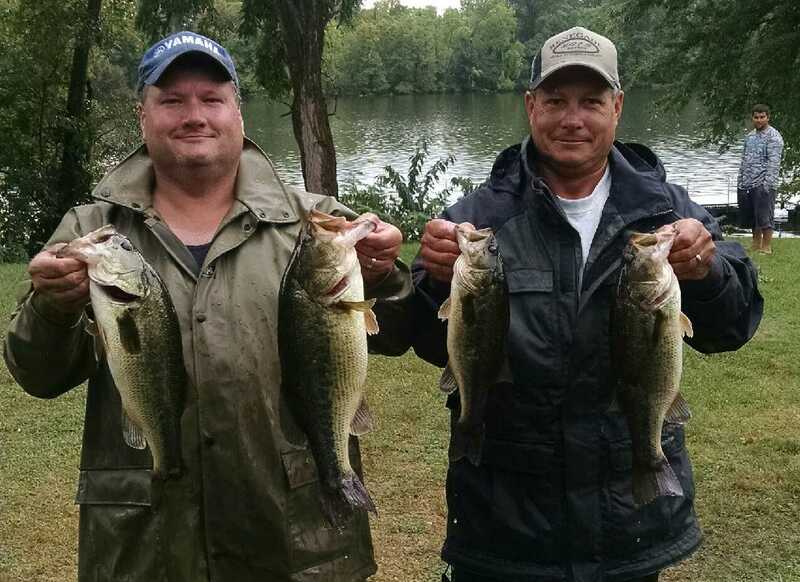 2nd Place: While no strangers to the R & B Bass Circuit, this was the first event Andy Jenkins and Scott Beard attended in 2015. They had no trouble making themselves comfortable by showing up to the scales with a 10.46 pound limit and taking $482 home. Despite their success, they had a trying day. It began well with a keeper fooled by a frog early on, but they then struggled to catch just four more keepers on a combination of Mango jigs and C Flash crankbaits. Beyond the frog, all fish were around current breaks. the team of Gary Price and Jim Meadows towed them in. This is another example why the R & B Bass Circuit members are the best in the world. 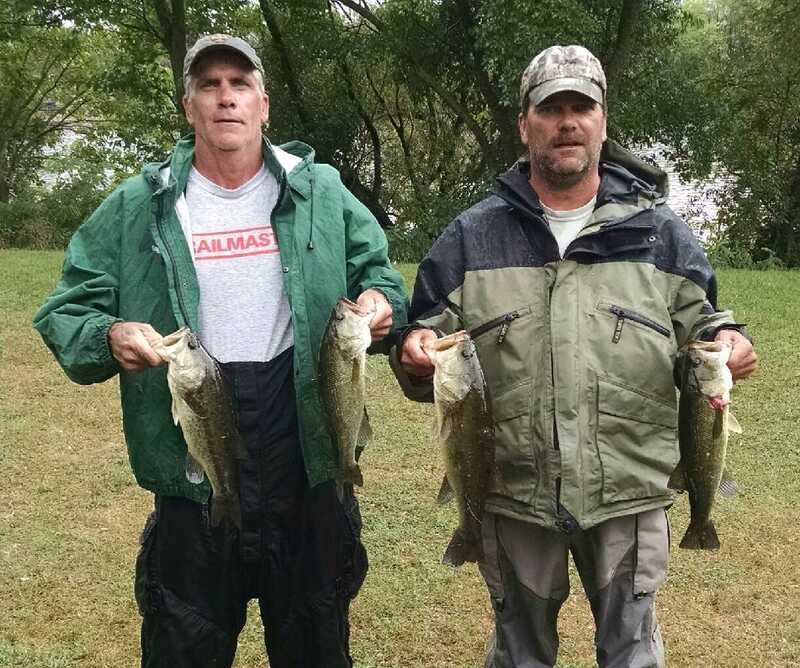 3rd Place: Renowned River Rats, Dan Frederick and Doug Roher, showed why they are revered as a perennial favorite on this stretch of the St. Joe. 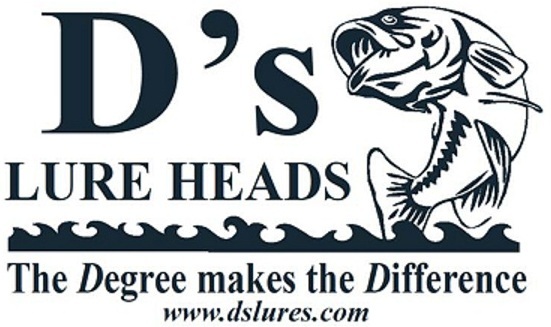 By employing their "bust and move" strategy, they landed at least 10 keepers with their best four weighing 10.25 pounds. They walked away $355 richer. "We junk fish," revealed Roher. "We go to an area, make a few casts, and if we do not catch a fish, we move on to the next." He added, "We go where no one else is. If we see a team on a spot, we move on to another." 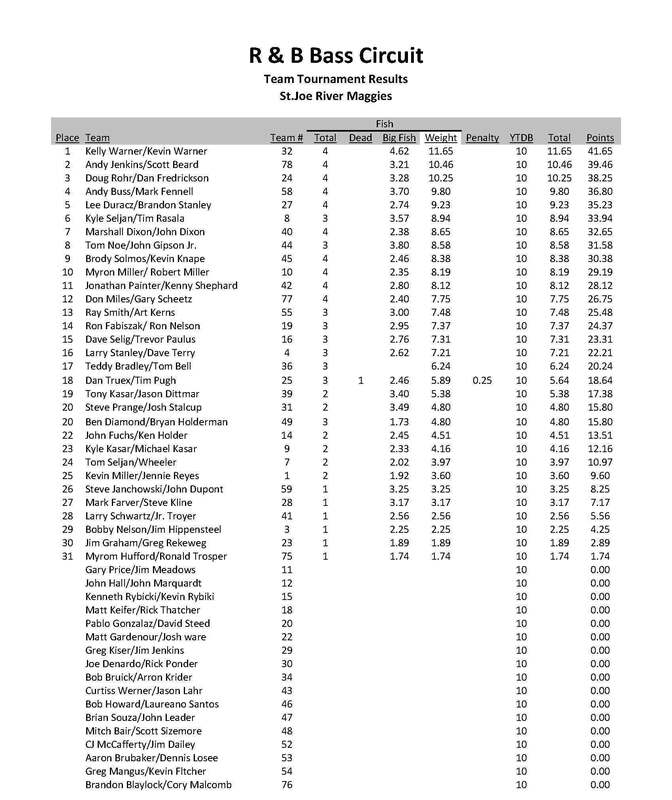 They did not catch many short fish, but caught twice as many keepers as any other team in the top 5. All fish came from jigs and the bite got better as the day warmed. By 11:15 they had a four fish limit, but they went on to catch another 6 keepers in the last three hours. 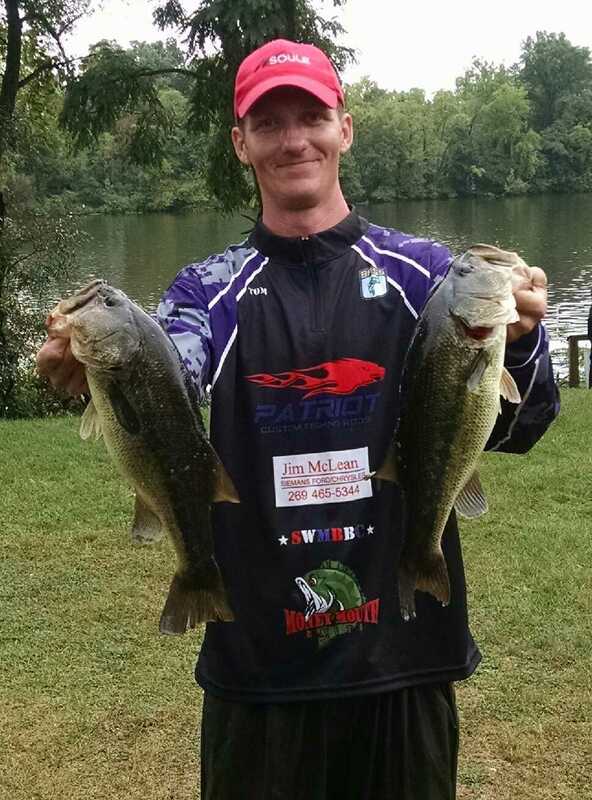 4th Place: It took just two casts for Mark Fennell to land a two pound largemouth on a frog to set up a top 5 finish for he and partner, Andy Buss. But his heroics were not done until the very end. With just minutes remaining, Fennell, caught a 3.70 pound largemouth on a D's Lures Wacker paired with a BPS Stik-O. His heroics vaulted the tournament directors up 12 spots to 7th place overall. The team netted five keepers total by flipping slop, twitching frogs, and Stik-O's. All fish were around thick weeds with intermittent wood mixed in two areas. 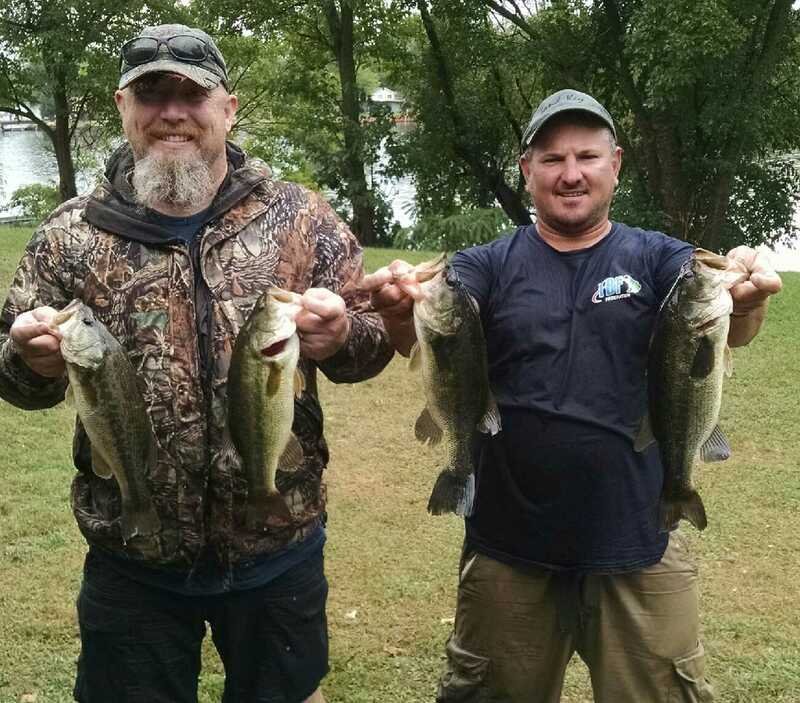 Their limit of largemouth weighed 9.80 pounds and won them $254. 5th Place:Lee Duracz and Brandon Stanley stuck to one bait and pattern all day that resulted in a 9.23 pound limit to claim $203. That bait was a Booyah frog fished among the thickest weed mats they could find. Stanley tells a funny story, "Early on I hooked one on the frog that bit at the end of a long cast. By the time I got it up to the boat I was so out of breath, Lee asked 'Need oxygen?'" Stanley got his revenge, though, as later in the day, "Then Lee caught one just like that, so I go to ask him, 'Need oxygen?'" They worked three areas to claim their fish, which produced six keepers. 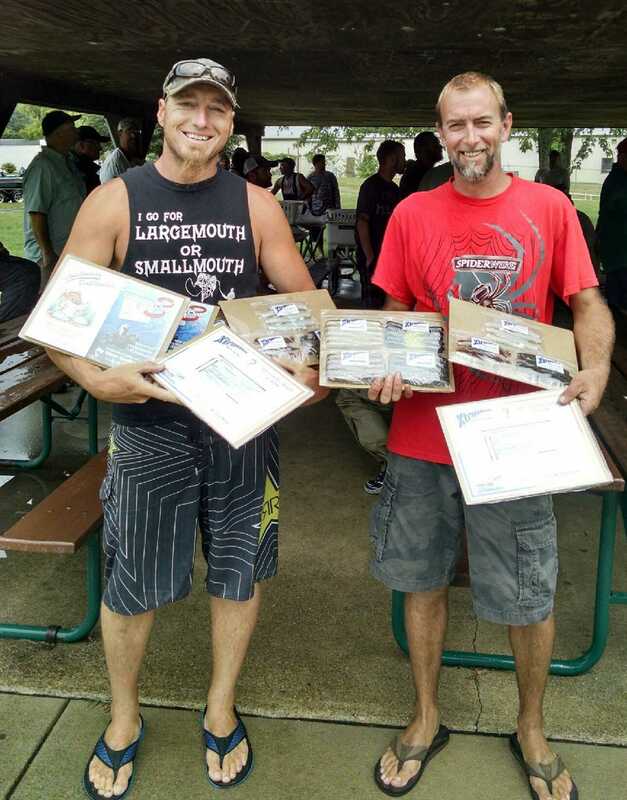 XBT Mystery Bait: Despite just catching one keeper, J.R. Troyer and Larry Schwartz still won over $200 in cash and prizes through the Mystery Bait presented by Wayne Carpenter and Xtreme Bass Tackle. 6th Place: An 8.94 pound limit won Kyle Seljan and Tom Rasala$178. 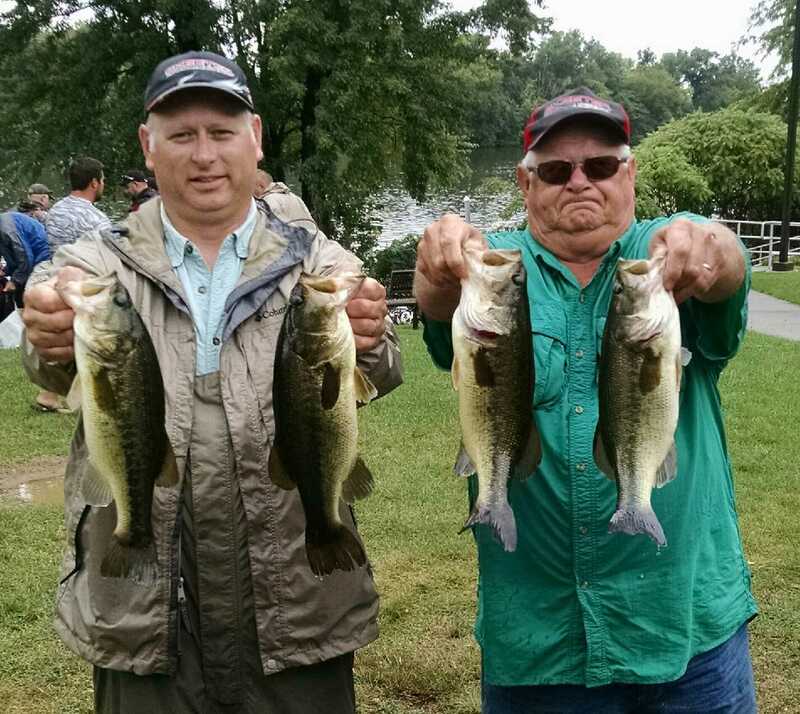 7th Place: The father-son team of John and Marshall Dixon (left) brought a limit weighing 8.65 pounds to claim $127. 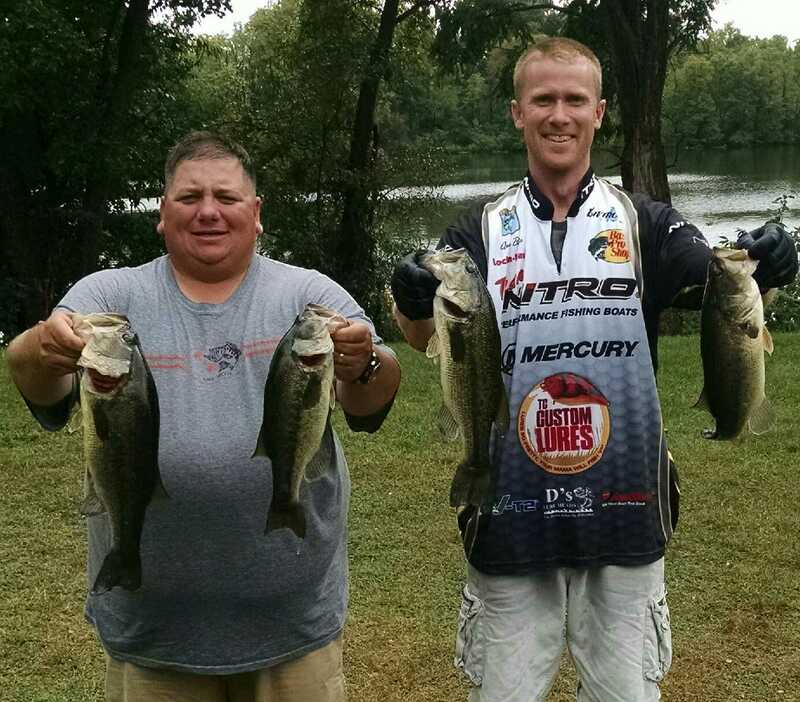 8th Place: The Standings leaders, Tom Noe (pictured right) and John Gipson, Jr., brought three fish weighing 8.58 pounds to win $102. They also brought the second heaviest fish of the tournament, a 3.80 pound largemouth to win another $96. 9th Place:Brody Solmos and Kevin Knape brought 8.38 pounds to the scales to claim $76. D's Lures Award:Myron and Robert Miller landed 8.19 pounds to claim the prize worth more than $50. 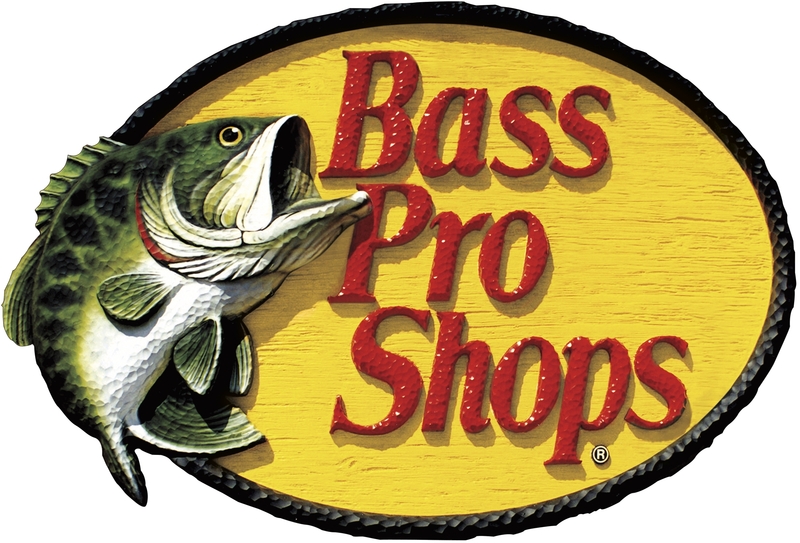 Bass Pro Shops Award:Dave Selig and Trevor Paulus finished 15th place with 7.31 pounds and won a Pro Qualifier reel provided by the BPS store in Portage, Indiana. Solar Bat Sunglasses Incentive: Finishing in 20th place with 4.80 pounds, Ben Diamond and Bryan Holderman qualified for the Solar Bat Incentive worth $100 in cash. Make sure you are qualified!